You never know who you’ll run into when you’re on vacation. 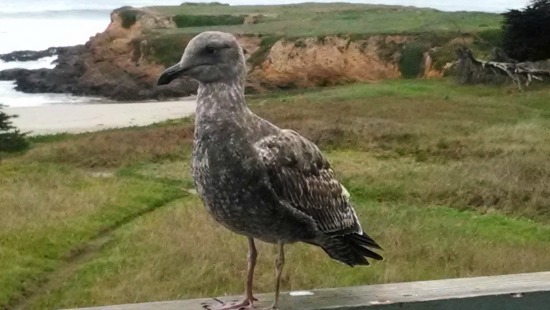 This morning, this guy was on the balcony railing outside our room in Fort Bragg on Northern California’s Mendocino coast. He’s a Pacific Gull, I believe. He was good at looking hungry. We had nothing to contribute to his breakfast. It looks like the same place we stayed in September. Looks like he was listening to you singing Ornithology. You’re in my neighborhood, Doug. Welcome to Northern California and the welcome rainstorm. Hopefully it will help our drought and not destroy your vacation. The gull can’t help it. (Groan!) Ah, Northern CA is a special kind of land with a coastline always tingling with many wonders, innit tho, Doug. Its sky at nightwhat a treat for the soul. Now, leave that laptop alone and return to the vacationing thing. Peace and love from over the pond.